The dependency on the altitude of the average annual temperatures above open land, as represented in figure 8.3, is shown by the one-year measurement series. The temperature in the area under investigation drops by about 0.3 to 0.5 K with increasing altitude. 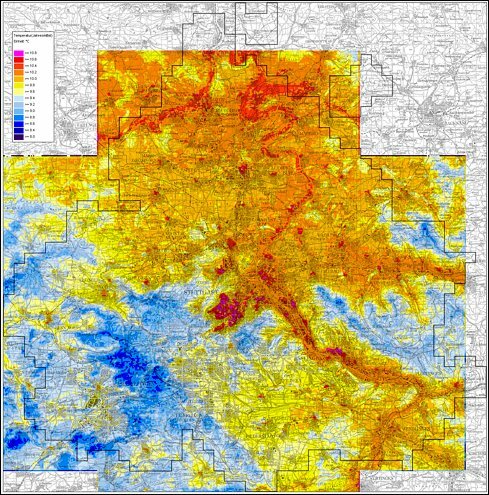 This vertical temperature distribution was transferred on a mathematical basis and with the help of the digital surface model to the whole area under investigation. This calculation model takes into account thermal effects in the context of settlement areas (heat island) by adding temperature, and it slightly deducts temperature in the case of forests and narrow valleys. The results show that the period between 1 May 1988 and 30 April 1989, when the measurements were carried out, was warmer by about 1 K than the 30-year average. Elevated areas, like the Filder plains, the Glemswald forest and Schönbuch natural park as well as the Keuperberg region in the east of the area under investigation (Schurwald forest, Buocher plains etc. 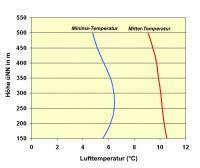 ), are characterized by relatively low average annual temperatures. The lower arable land in the North and especially the broad valleys of Neckar, Rems, Enz and Glems are warmer. You can see clearly the influence of the heat island effect in big settlements.